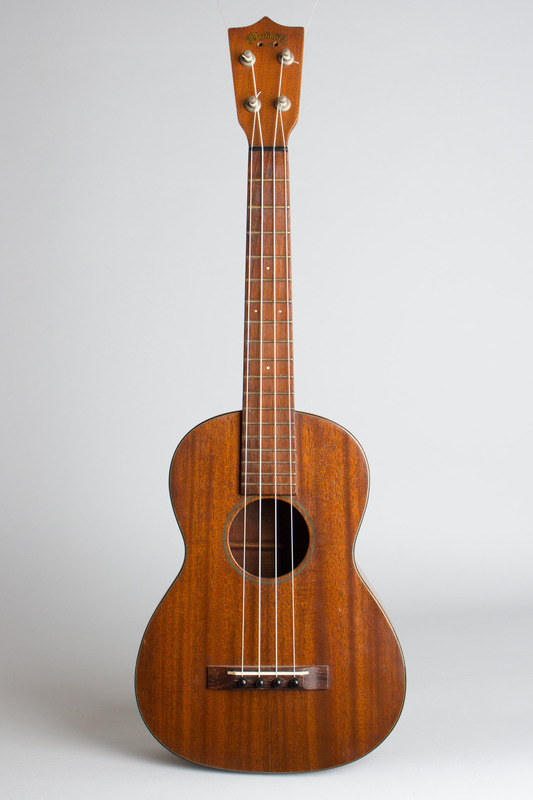 C. F. Martin Style 1-T Model Tenor Ukulele, c. 1940's, made in Nazareth, PA, serial # 1967038, natural lacquer finish, mahogany body and neck, rosewood fingerboard. 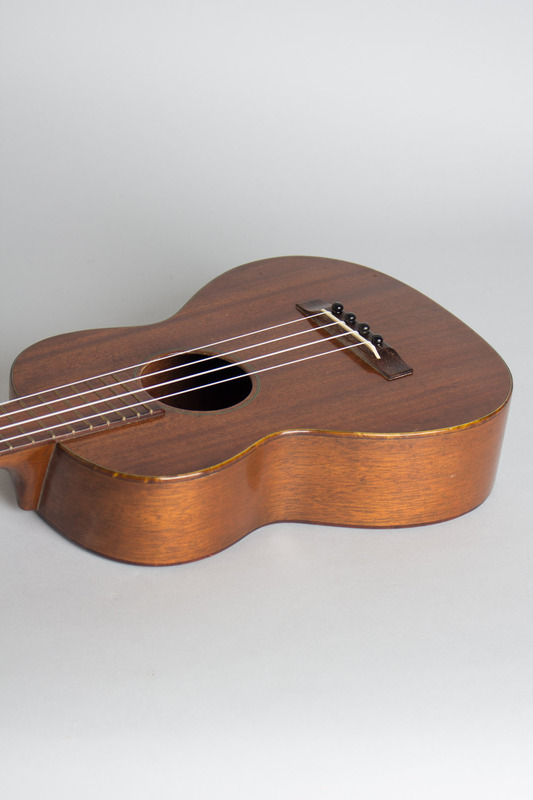 A good player's example of one of our more requested instruments: the Martin Tenor Ukulele. 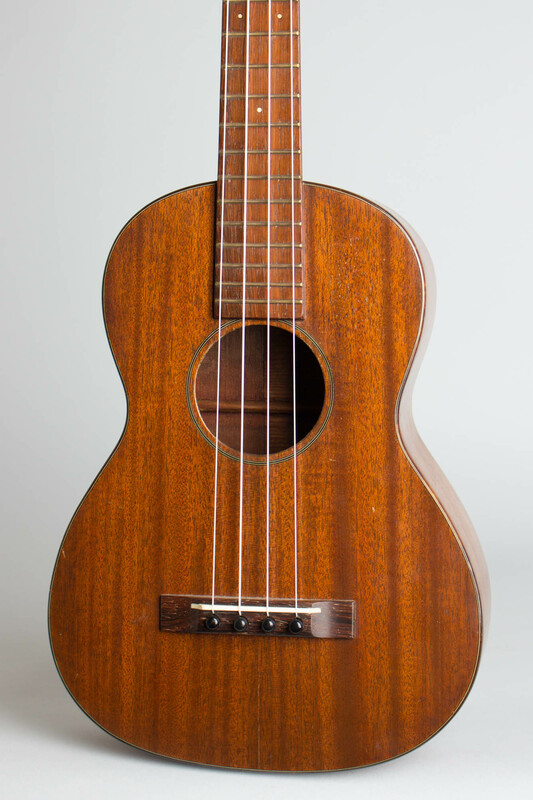 The much larger body and longer neck give not only a deeper, richer tone but the fingerboard has a lot more room for advanced modern uke stylings! 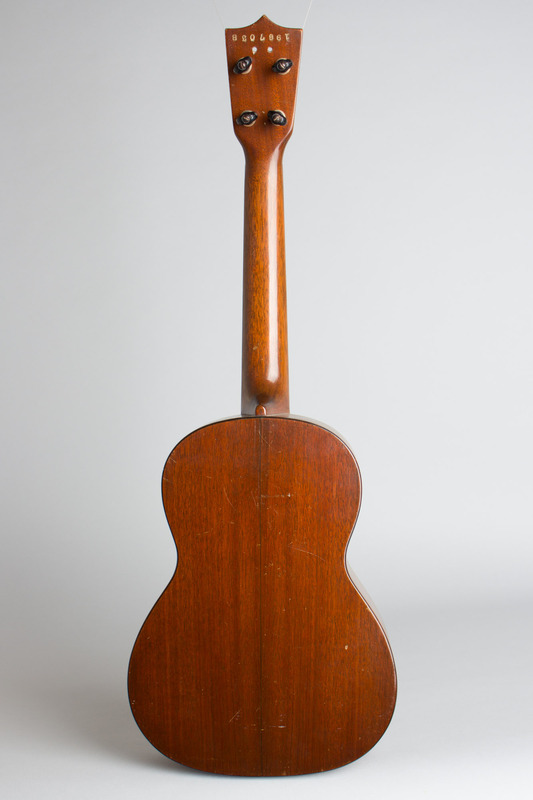 This one dates the 1940s and has several oddities, including original brass frets (very unusual on a Martin!) 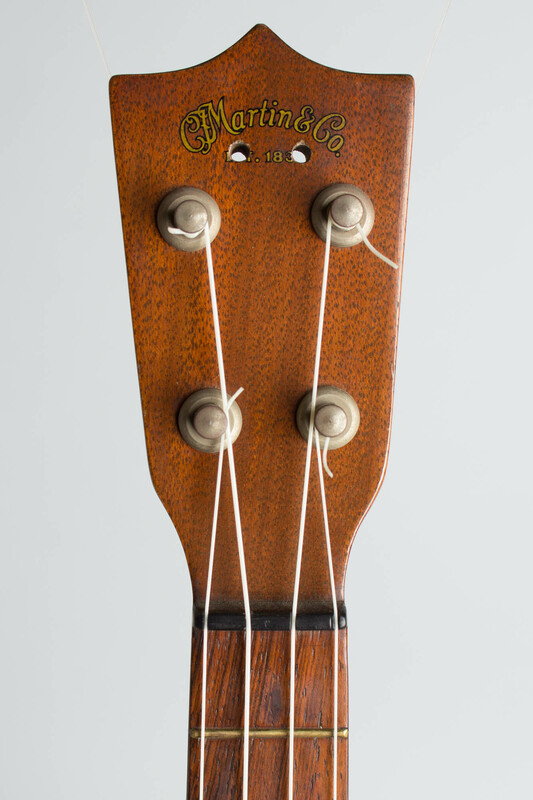 and a serial or stock number on the back of the headstock likely from a dealer or wholesaler that matches no known Martin series. A good player and a really nice-sounding uke. Overall length is 25 1/2 in. (64.8 cm. ), 9 in. (22.9 cm.) width, and 2 3/4 in. (7 cm.) in depth at side, taken at the end block. Scale length is 17 in. (432 mm.). Width of nut is 1 3/8 in. (35 mm.). Minor finish wear overall, but a nice example. 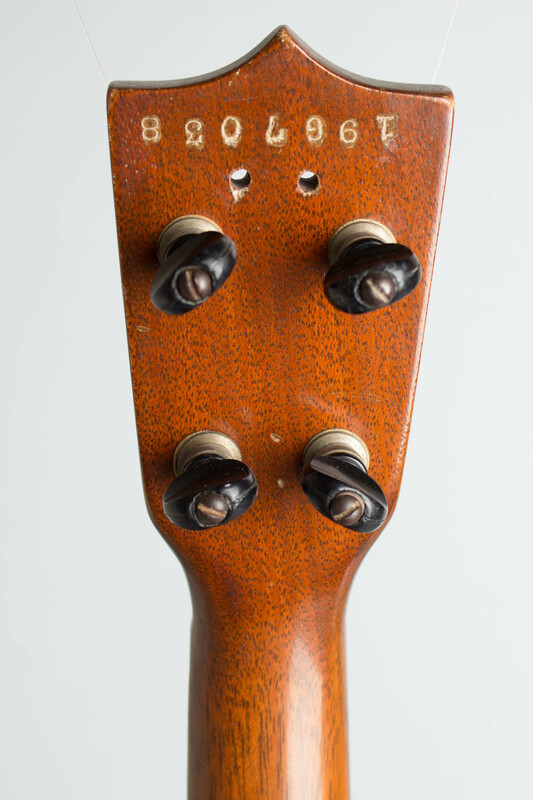 There are two cleanly closed top cracks; the other most noticeable defects are a small but deep ding on the bottom edge near the center seam and two small holes rather inexplicably drilled through the headstock, eliminating the "est." 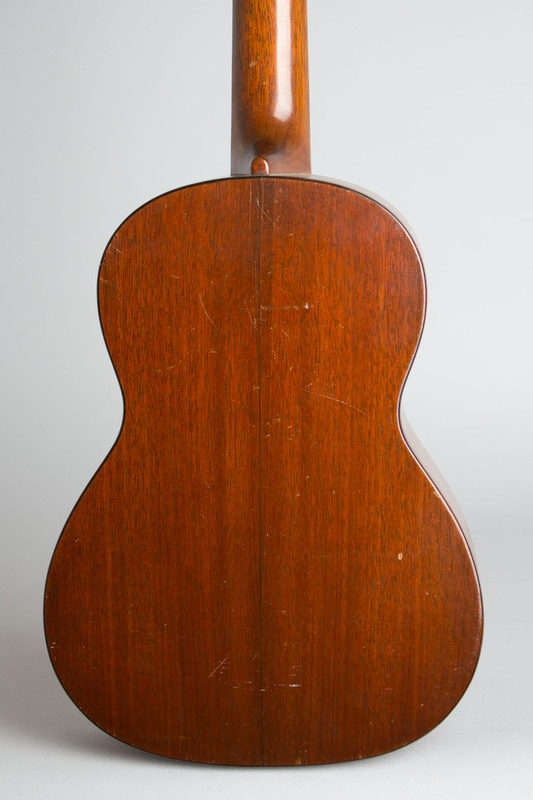 and the "33" part of 1833 in the Martin logo. Other than these oddities, a very nice and good playing example. Generally Excellent Condition.